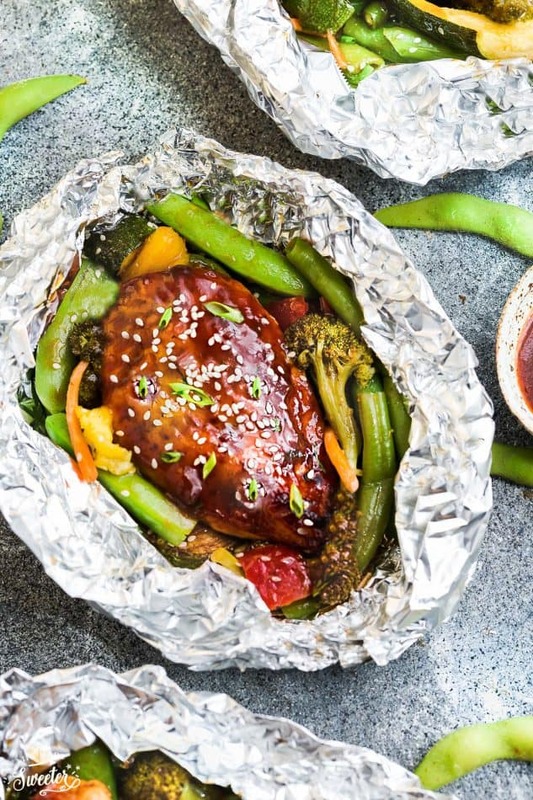 These Teriyaki Chicken Foil Packets are the perfect easy campfire or weeknight meal. Best of all, they are filled with a sweet and savory Asian glazed chicken, broccoli, edamame, green beans, pineapple and bell peppers. Throw them on the grill or in the oven to cook and serve with some rice or your favorite side dish. Pin for later or follow my recipe board for more easy dinner ideas. Summer is all about easy meals with minimal clean-up and foil packet dinners are just the solution. 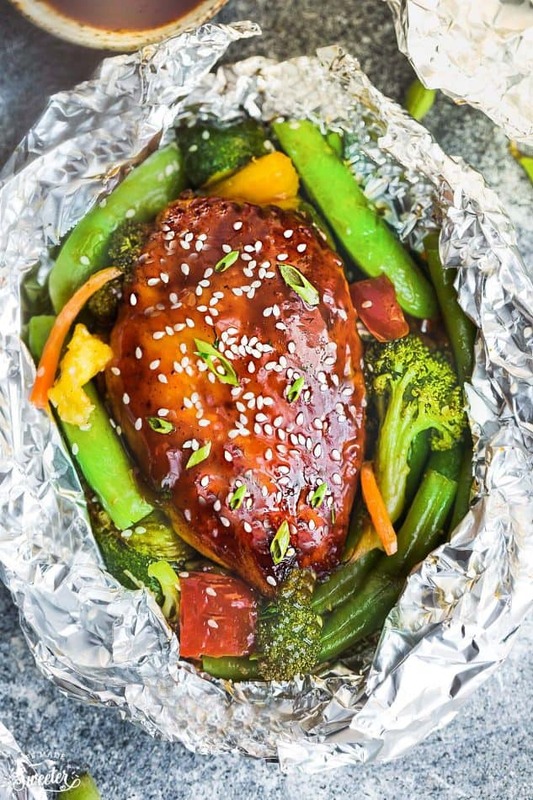 These Teriyaki Chicken Foil Packets are a complete meal that require hardly any effort! The great thing is that you can toss them on the grill while you’re camping or cook them in the oven on a busy weeknight. The best part is how easy these foil packet meals are to customize with your favorite protein or vegetables. 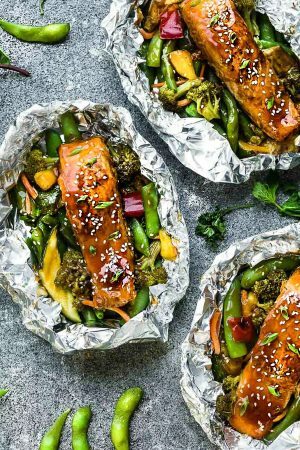 These foil packets are full of a sweet and savory Asian-glazed chicken, broccoli, bell peppers, pineapple, edamame, and green beans. It’s a classic flavor combination that makes for an amazing meal. This recipe starts off with a yummy sweet and savory teriyaki sauce. This homemade version requires just a handful of ingredients and is ready in minutes. However, you can totally use your favorite store-bought version in a pinch. Arrange your favorite veggies around the chicken. Drizzle the chicken and vegetable mixture with teriyaki sauce. Finally, wrap up in foil and bake or grill to tender perfection. Serve with some rice, quinoa or your favorite sides with a sprinkle of sesame seeds and green onions. These teriyaki chicken packets are the perfect easy weeknight meal. It’s a super easy way to have a fun and festive Asian-inspired dinner without a lot of clean up! For easier weekly meal prep – chop all the vegetables ahead of time and store in an airtight container the night before. 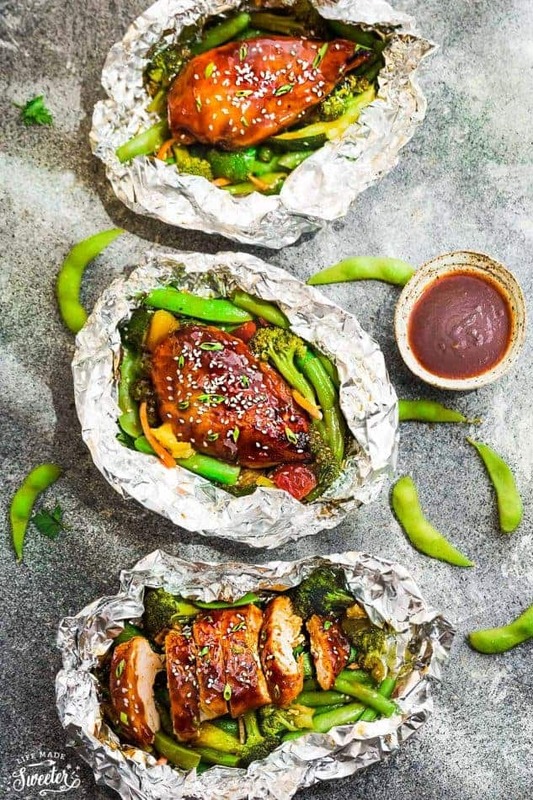 These Teriyaki Chicken Foil Packets are filled with a sweet and savory Asian glazed chicken, broccoli, edamame, green beans, pineapple and bell peppers. Throw them on the grill or in the oven to cook and serve with some rice or your favorite side dish. Preheat grill to medium-high heat or the oven to 425 degrees F.
Cut four 18 x 12 inch squares of foil* and lay out on a flat surface. In a saucepan over medium heat, whisk together soy sauce, honey, vinegar, sesame oil, garlic, ginger, cornstarch and water until combined. Bring to a simmer, stirring frequently, until sauce thickens and bubbles. Remove from heat and set aside. Place one chicken breast in the middle of each piece of foil and divide the vegetables evenly into each packet, arranging them around the chicken. Drizzle the chicken and vegetables with olive oil and season with salt and pepper to taste. Brush teriyaki sauce on both sides of the chicken and vegetables - reserving enough for later. Fold the foil over the chicken and seal to close off the packets. Place foil packets onto grill and grill for 7-8 minutes, then flip over and grill for an additional 6-8 minutes (depending on the thickness of the chicken) or until chicken is cooked through. Remove from the grill and carefully open the foil packets. If cooking in the oven Place foil packets on a baking sheet and cook for 25-30 minutes (or until chicken is cooked through, rotating tray once). Time varies depending on the thickness of the chicken. Remove baking sheet from oven. 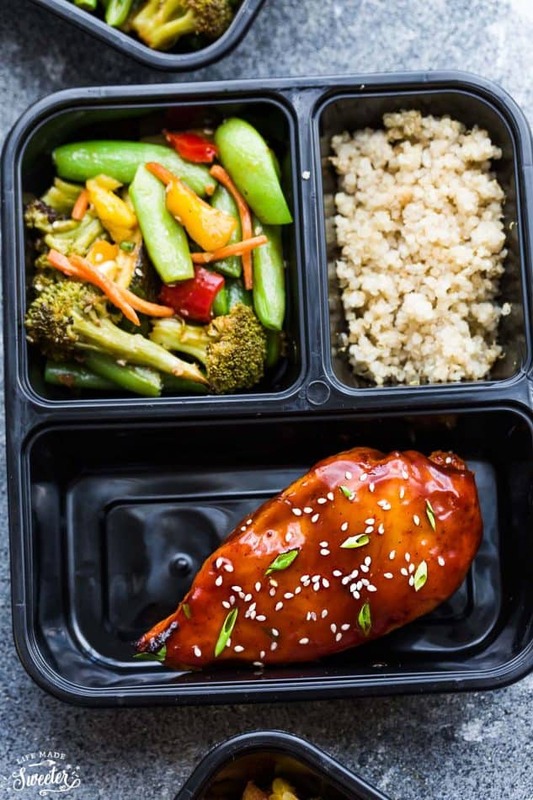 Brush chicken with reserved sauce and top with sesame seeds and green onions (if desired) and serve immediately with quinoa, rice or your favorite side. For meal prep Divide chicken and vegetables into lunch containers. Add your favorite side. 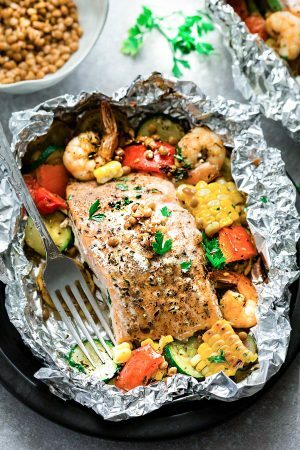 *if you prefer using parchment paper instead - you can also cut four 18 x 12 inch parchment paper squares and place them on top of the foil and place the salmon and vegetables on the parchment paper. Then double wrap the packets with the foil layer on the outside.